Mercedes: Are they blowing the Front or Rear wing? I’ve heard a lot of reporting about the Mercedes F-Duct stalling the rear wing and the likelihood of other teams already having a similar system. I can see the logic in why people think that the DRS controlled duct blows the rear wing elements in a bid to reduce drag. I haven’t seen any evidence of this being the case; equally I can see several issues with this theory. The problem with the theories on the DRS duct stalling the rear wing are twofold; firstly the DRS is already cutting immensely, secondly the rules greatly restrict the ability to stall the rear wing. Back in to 2010 teams were using blown slots across the full width of the rear wing, these being used with perpendicular blowing to stall the wing or tangential blowing to act as an additional slot gap for more downforce. The rules introduced in 2011 aimed to prevent both of these types of slot. To stall either the top rear wing or the beam (lower) rear wing, you need to blow a slot. 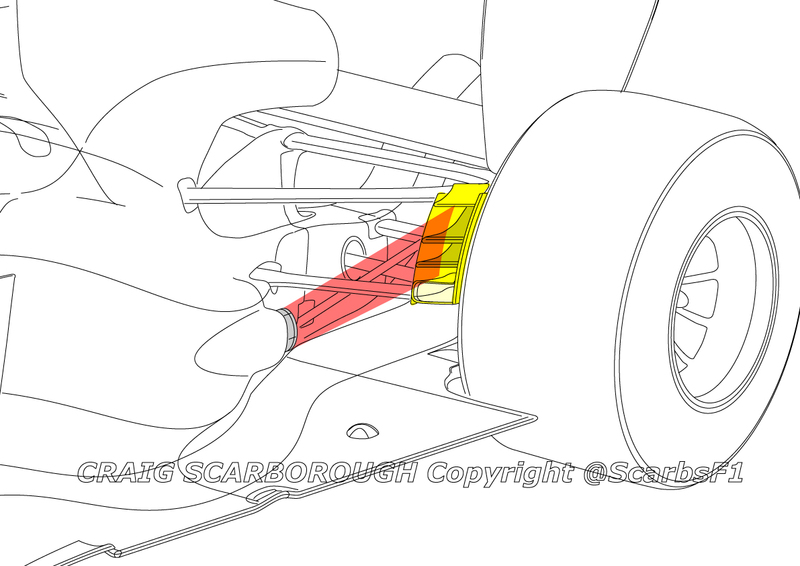 In the post 2010 rules, slots are banned in any section of the rear wing (via a 100mm minimum radius rule); this ban applies to all three wing elements aside from the middle 15cm. So to use the DRS duct to blow a rear wing slot, all you’ll stall is the very centre section of wing. This area creates very little induced drag (most of that’s created at the wing tips), so stalling it will not improve top speed by much. Thus it will provide very little benefit. It’s possible the DRS Duct could stall the flow around the sidepod, exhaust or diffuser. I’ve got no information on this, or a valid reason how this would benefit the aero. In my opinion the blowing to stall the front wing is still the most valid theory. Pictures have merged today of Schumachers car lifted on a crane that shows the slot sunder the front wing. other pictures also show close ups of the rear of the car, do not show any slots in the top or beam wings. I suspect the two ducts leading from the beam wing into the engine cover are part of the system. 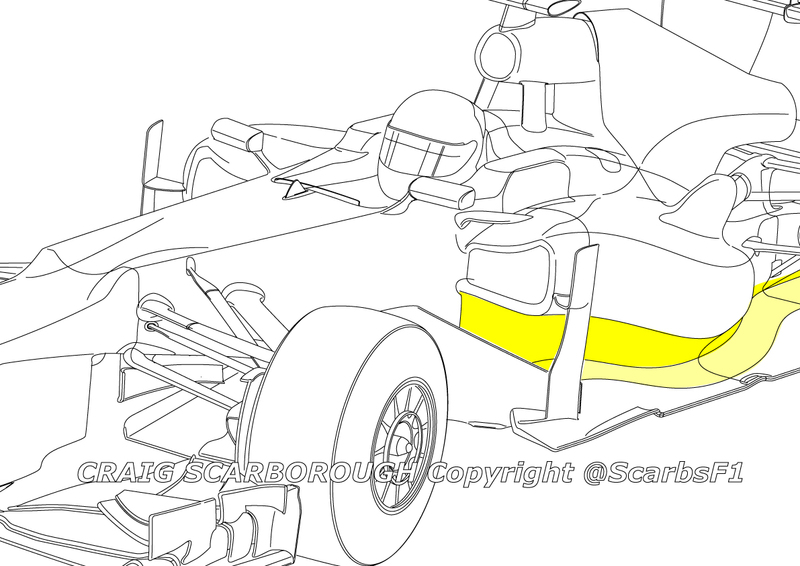 Either taking the DRS-duct flow to the front wing directly, or by using the DRS-duct to switch the F-Duct. I can;t find where the F-duct switch is sited, perhaps inside the rear wing, in which case the two beam wing ducts might be of different uses, one feeding high pressure airflow to the F-Duct and the other feeding the flow to the front wing. As this is an evolving theory, I’ll post more on this system as we start to understand it better. We have now acceptance by the FIA that the DRS duct is legal, that Mercedes are running this system and pictures show the duct emerging from the beam wing reaching forwards inside the engine cover. Presumably, to reach towards the front-end of the car. No doubt more information will soon emerge on these systems. Another possibility with the Mercedes stalling front wing is that it allows an opportunity to play with the linearity of the cars ride height. In particular the proximity of the splitter to the ground at different speeds. 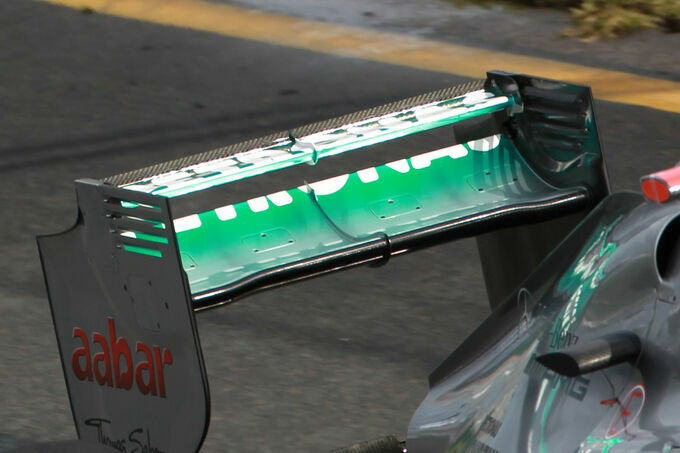 Looking at this in comparison to other possible uses, I would suggest this is a more realistic and beneficial solution than those initial proposed (https://scarbsf1.wordpress.com/2011/10/21/mercedes-f-duct-front-wing/). 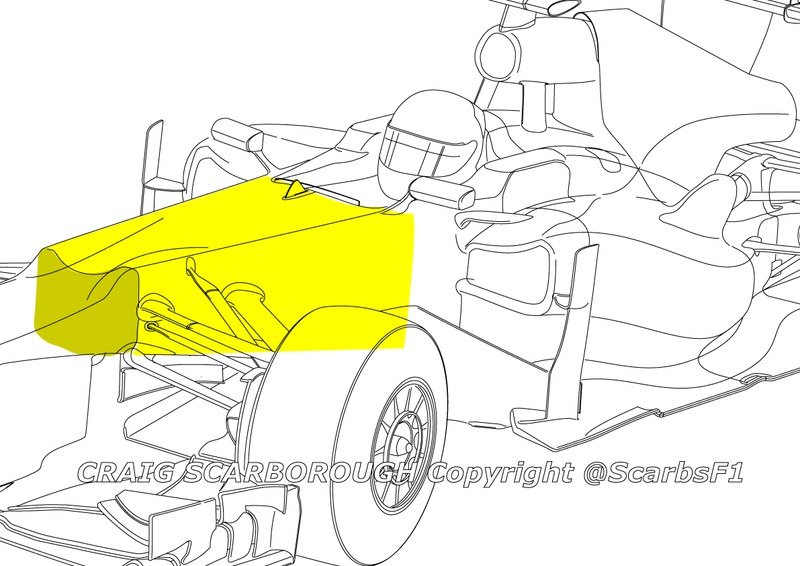 As has been much discussed, the front wing needs to run as low as possible to create downforce. To achieve this teams run as lower front ride height as possible. The limitation of a low front wing ride height is the front splitter grounding, this becomes an increasing problem as speed increases and the aero load builds up and compresses the front suspension. So at the ‘End of the Straight’ (EOS) at very high speed the car is at its lowest and splitter is grounding. This forces the car to have a higher ride height, to keep the plank from wearing away in the EOS condition. Thus at lower speeds the front ride height is correspondingly higher, compromising the potential of the wing. If Mercedes stall the front wing as the car reaches top speed, hence above the speed of any corner on the track. Then when the wing stalls, the load on the front axle will suddenly decrease and the front ride height will increase. Effectively the ride height\speed map is no longer linear. Ride height will decrease linearly at lower speeds, then above the speed of the circuit’s fastest corner, the wing stalls and ride height increases. What this allows the race engineers to do is shift the ‘ride height curve’ down the map for a lower initial (static) ride height. Knowing that the splitter will not ground in the end of straight condition. Therefore with the unstalled wing having a lower ride height, more downforce can be generated. When the wing is stalled the lack of downforce is less consequential as the car is on the straight. Plus there may still be the small boost in top speed from the lack of induced drag from the stalled wing. One other potential of such a solution is the front wing grounding. We have seen the midseason version of the Mercedes front wing ground quite easily in some turns this year. So as with splitter ride height, endplate ride height at top speed may become the limiting factor in benefiting from the wing flexing at lower speeds. Stalling the wing on the straight will see the load on the wing decrease and the wing will naturally flex upwards. Giving the opportunity to flex more at slow speeds and have the stall prevent grounding on the straight. In comparison to the manipulation of the CofP to resolve handling problems I initially proposed, this would be a more likely purpose of the stalling wing. Perhaps more importantly this would be a universal solution, one that other teams could legally adopt in preference to flexible splitters or excessive rear ride height to achieve lower front ride heights. 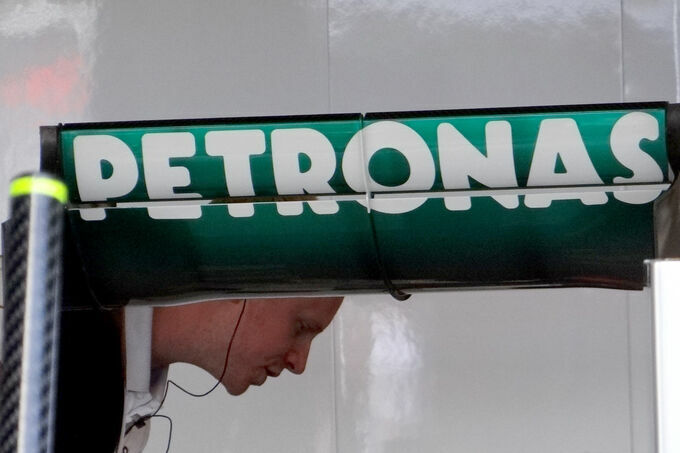 Mercedes GP are rumoured to be running a novel front wing. This has been reported in the three major F1 magazines (AMuS, Auto sprint and Autosport). It seems the front wing uses the nose hole to blow a slot under the wing. Although this is a completely passive system (i.e. no moving parts or driver intervention), the fact that it alters aero performance at speed, has seen it dubbed as an F-duct Front Wing. This solution was first heard of by Michael Schmidt of German magazine ‘Auto Motor und Sport’ (AMuS). Schmidt passed the tip off to Giorgio Piola who spent hours in the pitlane observing the Mercedes car and how mechanics handled the different wings. A task made additionally difficult, as he could not arouse suspicion by Mercedes and give away the fact he was researching the tip off. He found only two noses had the nose-hole with the splitter and that these wings were only carried parallel to the ground when moved around the pitlane. The final piece of the jigsaw was when he saw a mechanic inspect the wing with his hand leading to understand the slot placement and this information allowed him to work out the system and draw it for the aforementioned magazines. Its remarkable such a tiny detail can be observed and goes to show the hard work that went into Piola exposing this innovation. As described in the illustrations and texts, the wing assembly (including the nose) is as follows. The nose hole is used to pass air down through the front wing pylons into a slot on the underside of the wing. It appears that the slot has a wide span and is very narrow. 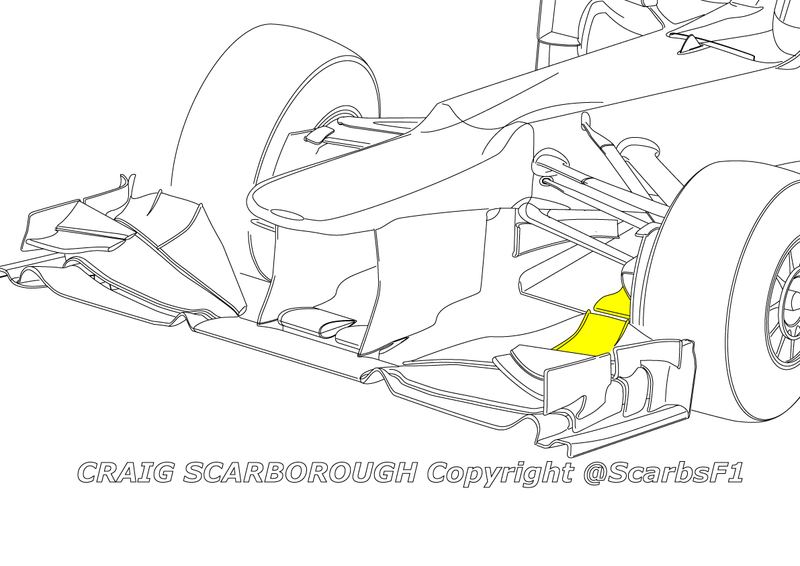 This design is somewhat similar to Mercedes early 2010 F-duct rear wing, which was passive. The driver didn’t have a control duct, as with the McLaren system. Instead the ductwork would only blow with enough force to stall the rear wing at a certain airspeed. Tricky to design and tune, this system worked well for Mercedes last year. 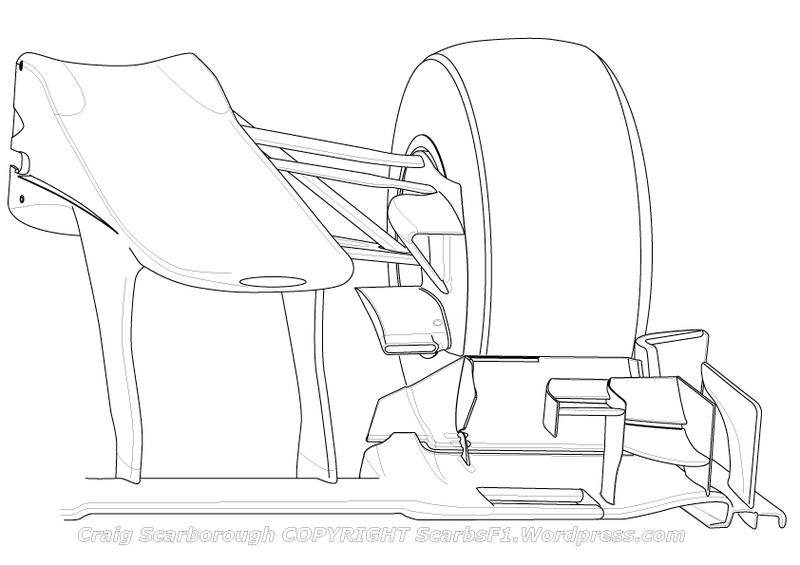 Its not improbably that just such a system could be made to work on the front wing. Aiding downforce or stalling the wing? Typically slots in the wing are for two purposes; aiding or stalling the flow over the wings surface. How the slot creates these two very different effects depends on the slots angle to the wings surface. To aid the airflow, you need a slot blowing nearly inline with the surface and airflow. Known as Tangential flow, this flat entry angle creates a relatively wide slot when viewed externally. To stall the airflow, you need a slot blowing at near right angles to the surface. This creates a narrow slot when viewed externally. Looking at what you need to aid or stall the airflow also requires different placement of the slot. To aid the airflow, you would inject the flow from the slot in an area downstream on the wings surface where the boundary has slowed and thickened. On a front wing this would arguably be somewhere on the flap towards its trailing edge. To stall a wing, you want to upset the airflow where it’s moving quite fast, for a front wing it would be placed towards the leading edge of the wing. Last year with F-ducts we saw the stalling slots initially placed on the flap, until Renault placed theirs on the main plane for a better stalling effect. 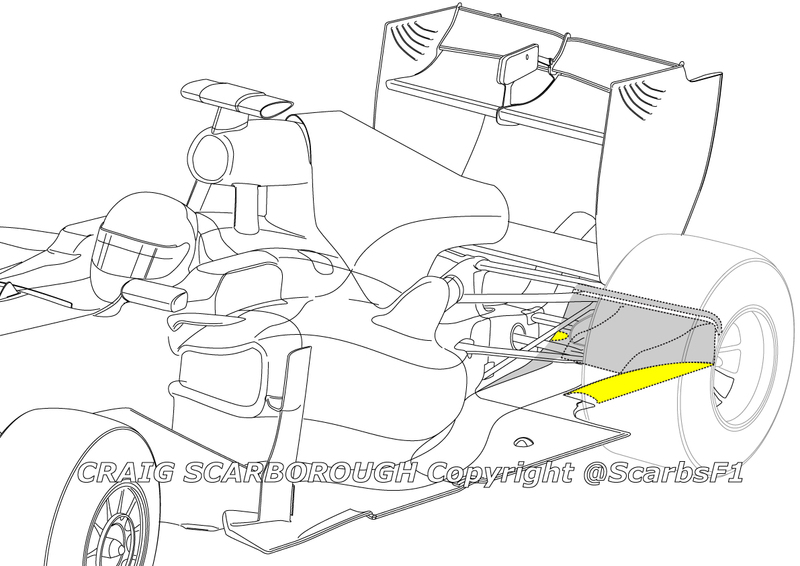 This analysis suggests the narrow slot towards the leading of the front wing is for stalling not aiding the airflow. However, while we have got this far in reverse engineering the Mercedes front wing. We now need to work out what the benefit of stalling the front wing is. When stalling aerodynamics there are two possible benefits. Reducing drag for more top speed or reducing downforce. For a front wing the drag loss wouldn’t be that beneficial on top speed. Sitting within the frontal area of the cars silhouette the front wing has very little form drag. However, induced drag from vortices produce particularly at the outboard ends is a factor, but far less than with rear wings. With teams increasingly bending their wings down at speed to gain greater downforce, they are creating most of the load towards the wing tips. By making the wing more aggressive at its outer ends, means that more vortices will be produced and sent around the front tyre. This flow structure creates drag and stalling the wing, especially near the tips would reduce this drag and boost top speed. Martin Whitmarsh was quoted in the AMuS article as suggesting a 5/8kph gain from stalling the front wing. With the front wing stalled, some of the energy it robs the airflow can pass towards the underfloor, increasing the pressure at its leading edge, forcing more flow under the floor for more downforce. With more downforce from the underbody, a smaller rear wing can be raced, which also creates less drag for more top speed. But that may not be the greater goal of stalling the front wing. Instead the aim may be managing the balance of the car through out its speed range. This would be done by the loss of downforce altering the cars Centre of Pressure. 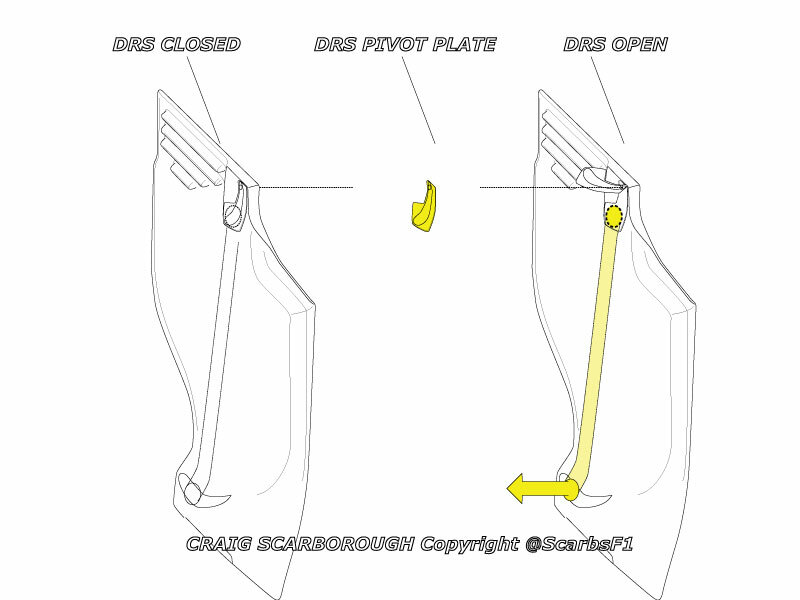 Firstly, let’s review what the front wing does for the cars dynamics at different speeds. 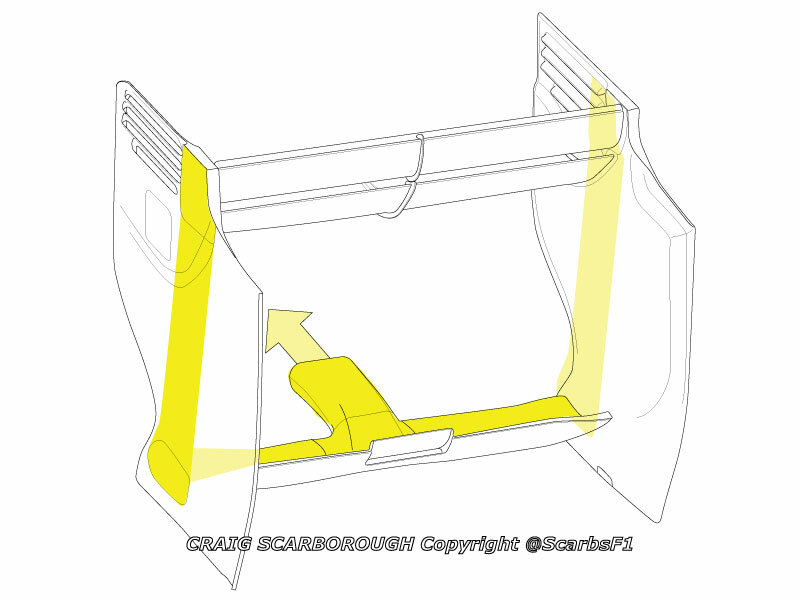 An f1 cars downforce is produced largely by the front wing, rear wing and the floor. 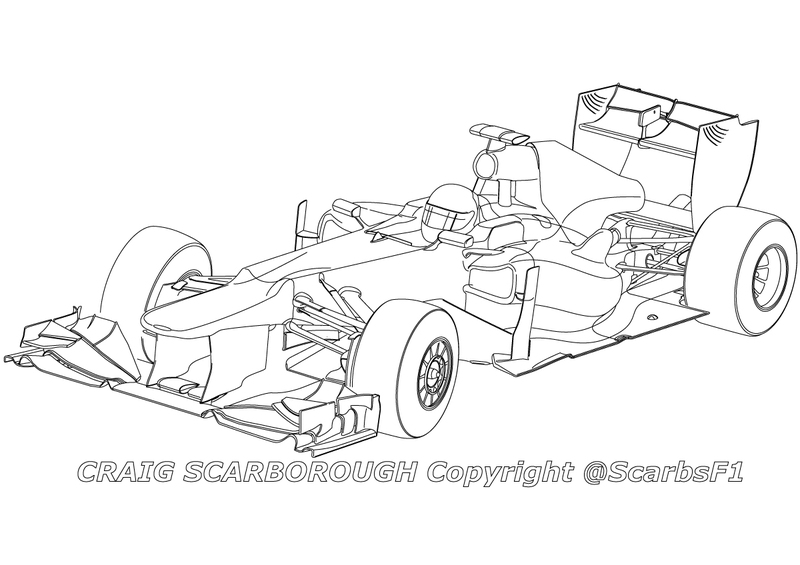 With the front and rear wings being the main tuning elements. By tuning the front and rear downforce you alter the cars Centre of Pressure. Centre of Pressure (CofP) is the balance of downforce at the front and rear axles. As such it’s analogous to being the aerodynamic equivalent of Longitudinal CofG (balance of mass between the axles). CofP is also known as termed as aero balance. Typically the CofP position closely matches that the CofG. Starting from around 1-2% behind the CofG, then as the car gains speed the car gets lower making the front wing and diffuser work better. 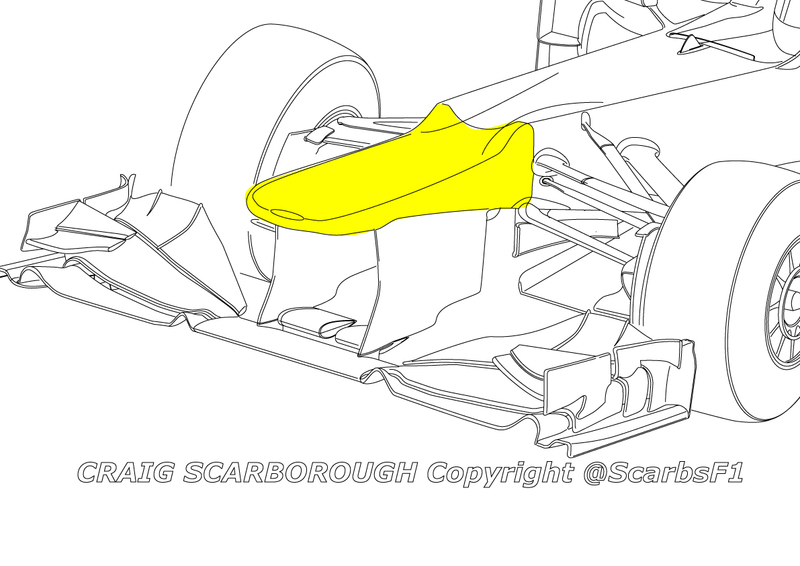 Fairly soon the stepped bottom\plank choke flow into part of the diffuser, this robs the diffuser of some downforce. 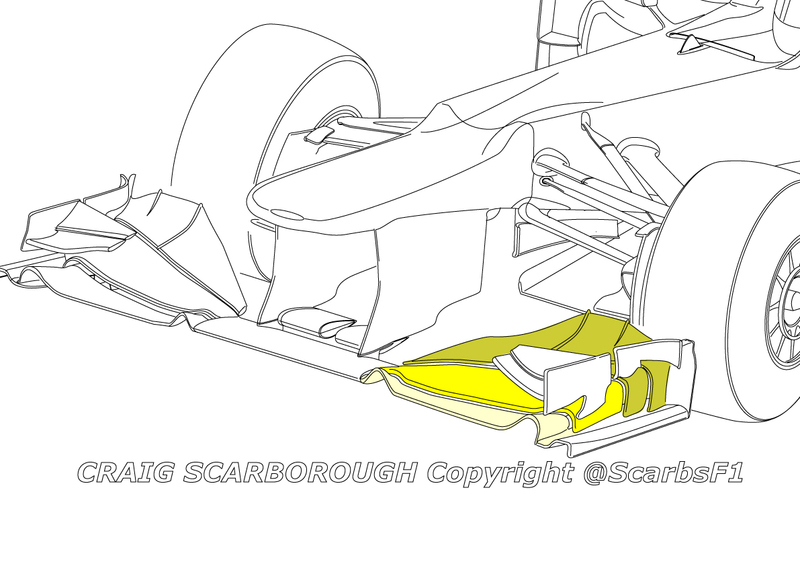 While as the front wing gets closer to the track, it works in ground effect to create even more downforce. The combined effect of the loss of some rear downforce and gain in front downforce is that the CofP moves further forwards. Such is the potential of the front wing and the near equal tyre sizes front to rear; an F1 car is largely limited on corner entry by the rear grip available. In low to mid speed turns the car needs a slight rear bias to the CofP, this prevents the car suffering corner entry oversteer. Where the car wants to spin as it approaches the apex. Too much front wing in these corners will make the car too pointy and hinder laptimes. In faster turns the front wing can lead the car. The drivers turn in gentler to fast turns, which creates less lateral acceleration at the rear axle. So it’s rare for the rear to step out on turn-in to fast corners. Thus, at higher speeds you can have a CofP biased towards neutral or the front. Last year with the adjustable front flap, (rather than used for the overtaking balance adjustment for which it was designed) teams would use alter the front flap angle into a fast turn. So typically you wouldn’t want to shed front downforce for fast turns, by stalling the front wing. Stalling the front wing will reduce front downforce and drive the CofP rearwards, robbing the driver of front axle load just when he needs it. 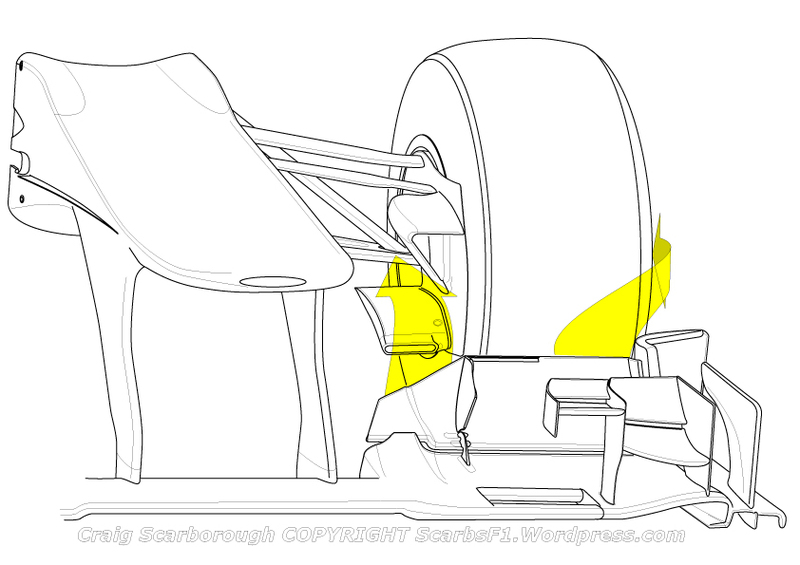 But, the move towards a rear biased high speed set up could be a response to other problems with the chassis. We knew the 2010 Mercedes W01 suffered understeer and Michael Schumacher didn’t like that facet of its handling, even though Nico Rosberg could cope with it. Perhaps Schumacher’s style of being aggressive on initial turn in, helps the car to rotate into turns more to gain speed through slow\medium speed corners. This tendency corner entry oversteer wasn’t present in the 2010 chassis. The 2011 W02 is shorter and designed to rotate better, it certainly isn’t a natural understeer. We can suggest this forwards bias, as a possible reason for the car being hard on its rear tyres. So if the W02 has a forward biased aero balance, this would move the car closer towards corner entry oversteer. We’ve also seen the mid season wing upgrade displays some flexibility, as with many teams front wings. This would have the effect of moving the front wing in yet closer proximity to the track and create even more front downforce at higher speeds. So with the W02, as speed increases and the CofP moves forwards. Now the corner entry oversteer create a danger of high speed spins, the team need to calm the chassis down a little. 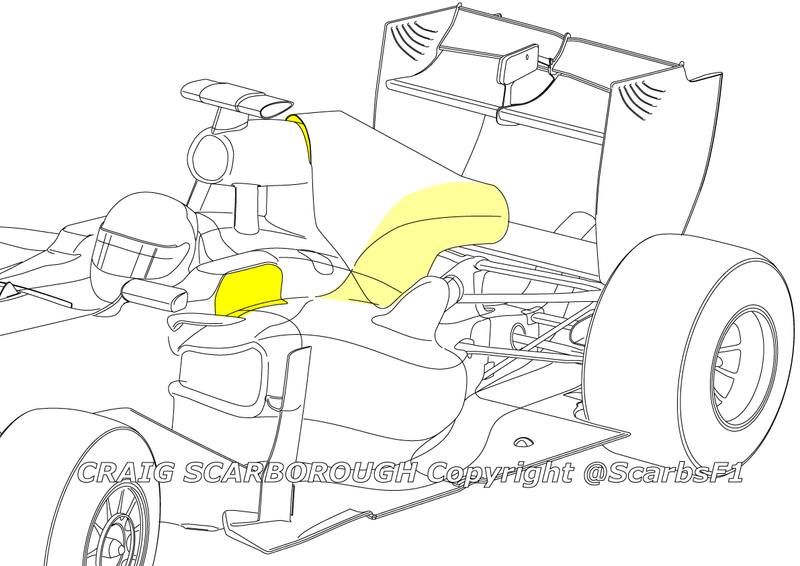 So when the wing stalls, the CofP moves rearwards and gives the drivers more confidence with a little understeer. In Michaels case his naturally aggressive turn in is tolerated and as we’ve seen Rosberg can cope with understeer. So both drivers benefit. This might also save the tyres from slip in high speed turns, which could be detrimental to the tyres grip. Another possibility with the stalling front wing is that it’s allowing an opportunity to play with the linearity of the cars ride height. In particular the proximity of the splitter to the ground at different speeds. Looking at the options listed above, I would definitely say the cars wing is stalling. with little to be gained from drag reduction the stalline is most likley to create another effect on the chassis. In comparison to the manipulation of the CofP to resolve handling problems, the speed sensitive ride height control would be a more likely purpose of the stalling wing. Perhaps more importantly this would be a universal solution, one that other teams could legally adopt in preference to flexible splitters or excessive rear ride height to achieve lower front ride heights. So if we now accept that this theory is how the might wing work, we need to look at the legality and construction of the set up. Firstly a passive system that involves no moving parts or driver intervention is legal. 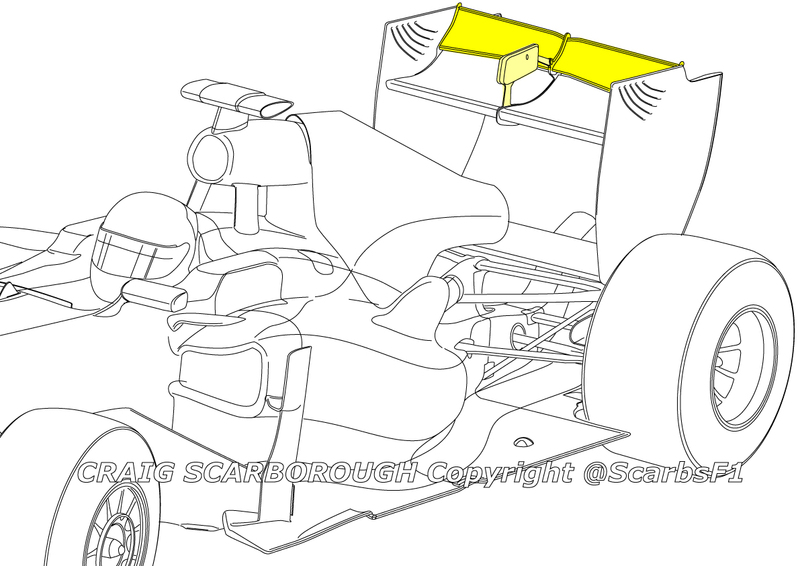 Secondly the rules on the closed sections forming the front wing are much freer than those applied to the rear wing. 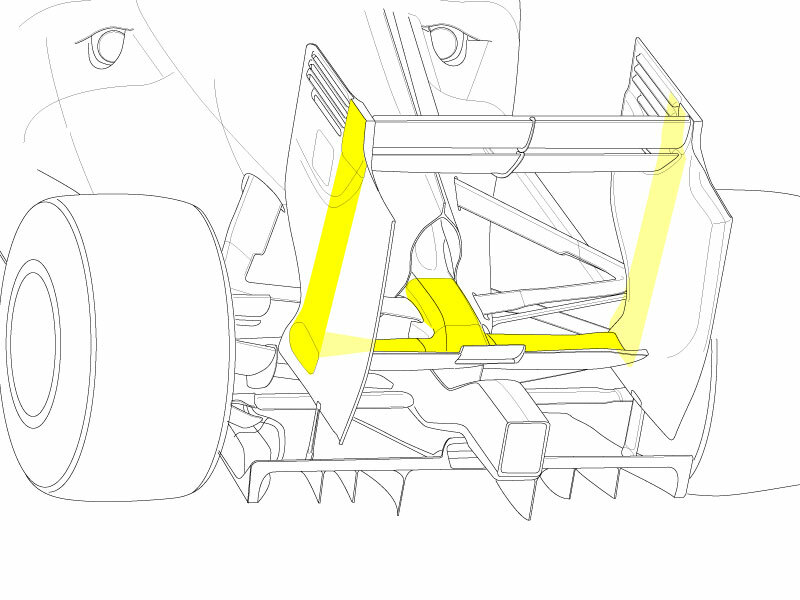 So slots can be legally made across the side spans of the front wing. Clearly it would be legal in both of these respects, that the stalling slot can be made to blow at certain speeds. The biggest issue is with the nose hole itself. This is covered in the rules and is allowed for the purposes of driver cooling. This being worded into the nose cone regulations for 2009 to prevent Ferrari style slotted noses. We know the nose hole is used to blow the front wing for several reasons. Firstly Mercedes do have the nose hole, but rarely use it, instead the duct moulded into the access panels atop the chassis are normally used for driver cooling. Most of the time the nose hole is sealed up with clear tape. But one crucial picture in the AMuS gallery accompanying their article, was of the car with the nose removed, showing a black carbon fibre cover going over the front bulkhead. This would seal the nosecone, such that air entering the nose hole would not pass into the cockpit and instead pass down the wings support pylons. 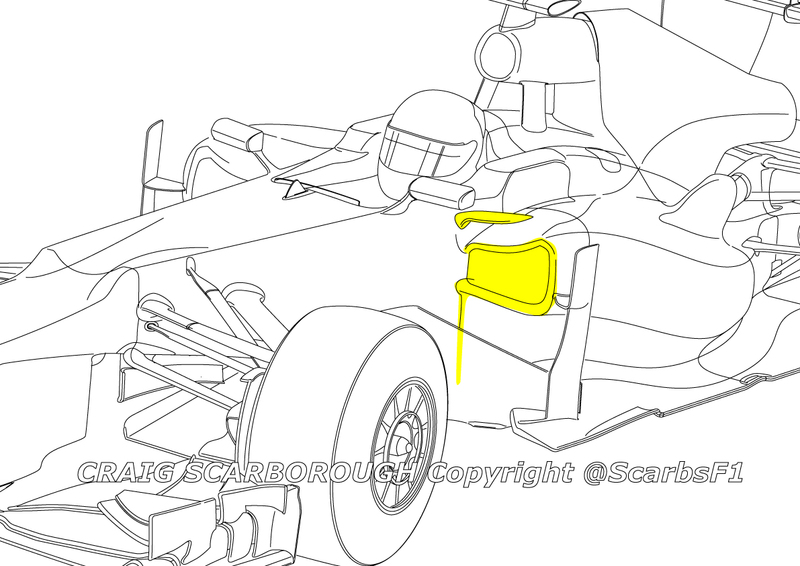 With this panel in place the nose hole cannot function as driver cooling and goes against the rules. Perhaps this set up using the nose hole was just at Suzuka for testing, as Teams are unable to do much full scale testing away from the circuit. It could be legally run in a Friday practice session, as teams are given some leeway to test parts which might otherwise be unacceptable to the scrutineers. As long as the parts aren’t run for qualifying, then apparently illegal parts can get limited Friday running. 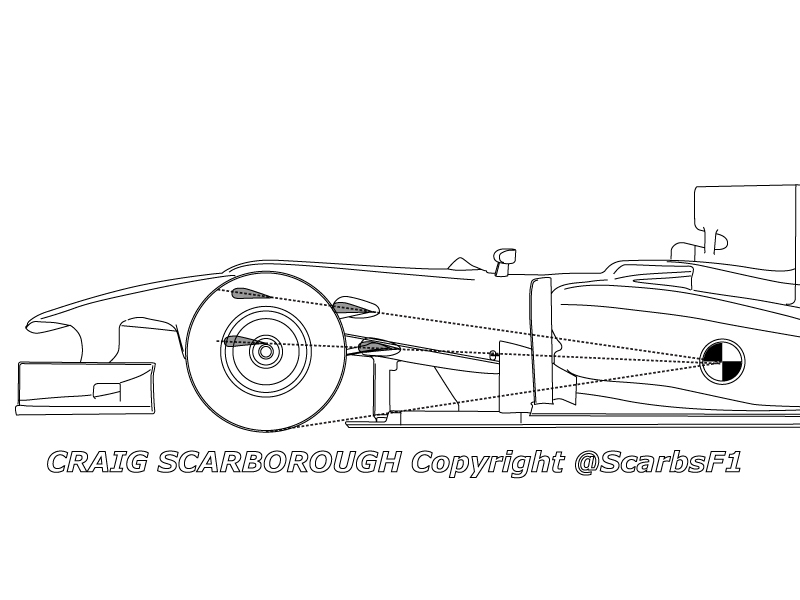 So for 2012 the wing might gain its inlet from another position. At Suzuka, the use of the nose hole might have been a good way to disguise the system when it was tested. I have to thank the many people who aided me in my countless questions on this design. Thanks for your patience. When Red Bull Racing launched their new car for 2011, the event was marked by a very special press pack. The pack was formatted in the style of the well-known Haynes maintenance manuals (PDF). This in itself this was a great book, but almost unnoticed within its pages was the intended publishing of a complete Haynes style workshop manual on the RB6 car. Now some six months later the Haynes Red Bull Racing F1 Car Owners Workshop Manual (RB6 2010) has been published. As its rare a Technical F1 book is published, not least one with insight into such a current car, I’ve decided to review the book in detail. At 180 pages long the book has enough space to cover quite a wide range of topics and it does so. Starting with a background to the team, moving on to the cars technology, to overviews of its design and operation. With its familiar graphical style and hardback format it certainly gives the feel of a proper workshop manual. However this is somewhat skin deep and the pages within, soon revert to a more typical book on F1, although some flashes of the Haynes style do remain. Steve Rendle is credited as the writer of the book and Red Bull Racing themselves have allowed close up photography of the car and its parts, as well as providing a lot of CAD images. But clearly a lot of editing has been carried out by Red Bull Racing and the book falls short of its presentation as a manual for the RB6. Despite its confusing title, the book is probably better described as a summary of contemporary F1 technology from the past 3 years. As the last in depth technical F1 book was the heavy weight title from Peter Wright showcasing Ferraris F1 technology from 2000, this remains a useful source of recent F1 technology. This places the books target audience, somewhere between the complete novice and those already of a more technical mindset. With forewords by Christian Horner and Adrian Newey, the opening 21 pages are a background to the team and detail of the 2010 season that brought RBR the championships. Then starts the core 100 page chapter on the cars anatomy, which opens with a pseudo cutaway of the car showing a CAD rendering of its internals. 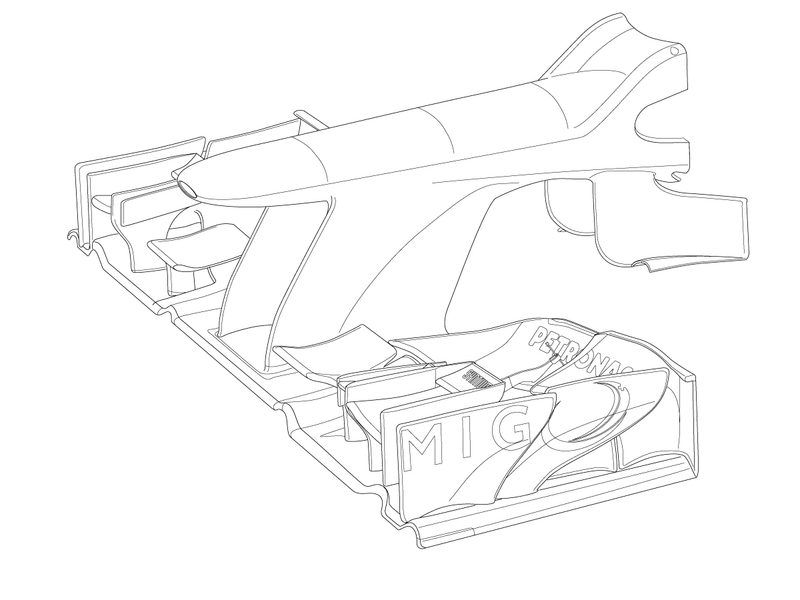 Firstly the monocoques design and manufacture is covered, with images of the tubs moulds being laid up and CAD images of the RB4 (2008) chassis and its fuel tank location. Although little is made of the fuel tank design. Moving on to aerodynamics, the text takes a simplistic approach to explaining aero, but there is an interesting illustration of the cars downforce distribution front to rear. This does highlight the downforce created by the wings and diffuser, but also the kick in downforce at the leading edge of the floor, but this is not adequately explained in the text. 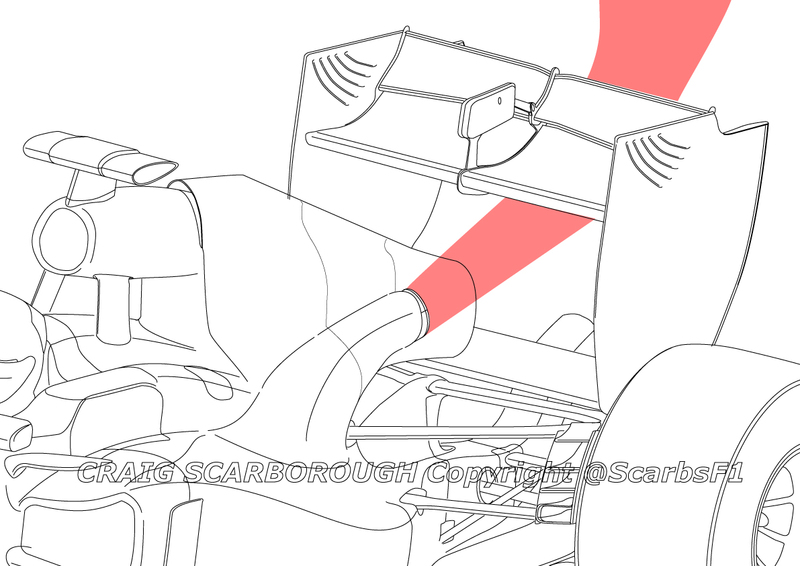 Mention is made of the front wing and the flexing that RBR deny, this is explained with a simple illustration showing the deflection test. 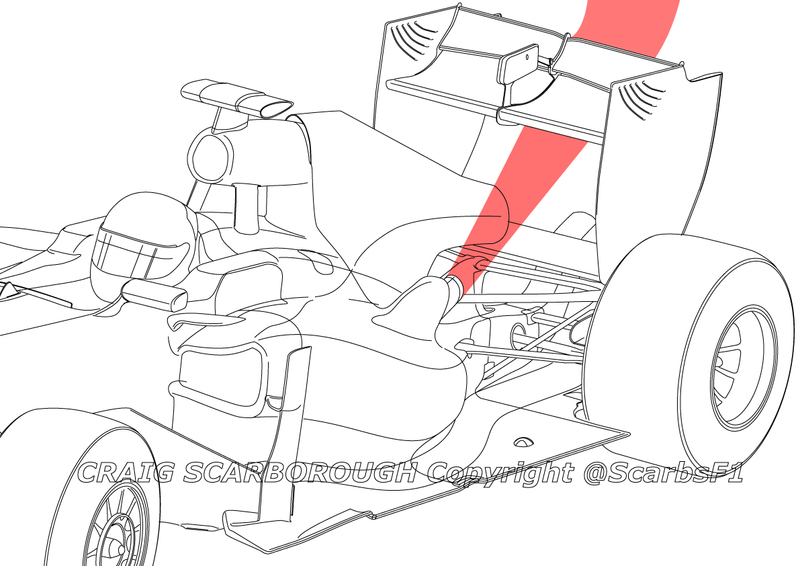 The driver adjustable front flap, which was legal during 2009-2010 seasons, is explained, in particular that the wing was hydraulically actuated. When I understood that in 2009, only Toyota used a hydraulic mechanism over the electric motor system used by all other teams. In trying to explain the nose cone, the text and an illustration show a high nose and low nose configuration, but does not remark why one is beneficial over the other. This section also covers very brief summaries of bargeboards, sidepods and the floor. Some nice close up photos of these parts included, but again with little explanation. 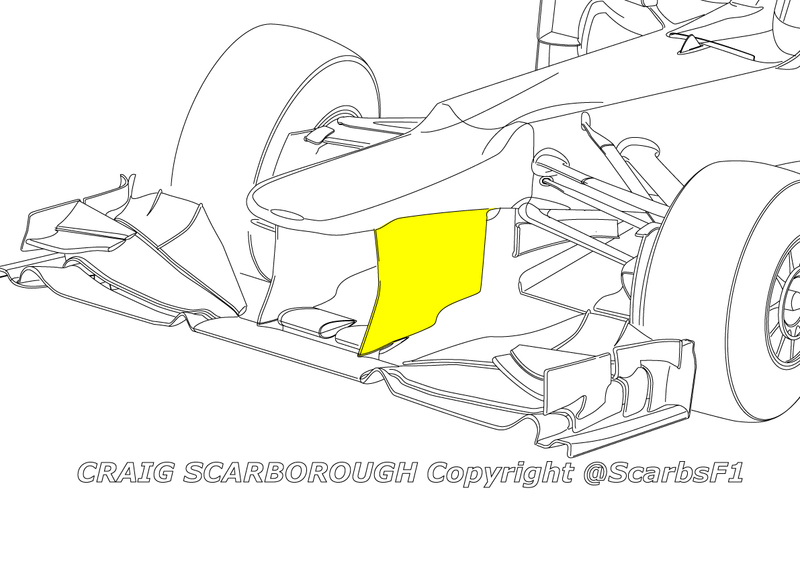 An illustration at this point highlights the other FIA deflection test altered in 2010, which was aimed at Red Bulls alleged flexing T-Tray splitter. In this section the text cites Ferraris sprung floor of 2007, but not the allegation that RBR’s was flexing in 2010. A further simple graphic illustrates the venturi effect of the floor and diffuser, and then the text goes into simple explanations of both the double diffuser and the exhaust blown diffuser. Having been one of the technical innovations of 2010 and since banned, the book is able to cover the F-Duct is some detail. A complete CAD render of the ducting is provided on page 53; this shows an additional inlet to the drivers control duct that was never visible on the car. This extra duct served the same function as the nose mounted scoop on the McLaren that introduced the F-Duct to F1. Thus with aerodynamics covered in some 23 pages, the text moves onto suspension and the expectation of detail on the RB5-6’s trademark pullrod rear suspension. After a summary of the purpose of an F1 cars suspension, Pages 58-59 have some fantastic CAD renderings of front suspension, uprights and hub layouts. However the rear suspension rendering stops short at the pull rod and no rocker, spring, damper layouts are detailed. Hardly a secret item, so lacking this detail is let down for a book announced as an RB6 workshop manual. A lesser point, but also highlighting the censorship of some fairly key technical designs, was the lack of any reference to Inerters (Inertia or J-Dampers), The suspension rendering simply pointing to the inerter and calls it the ‘heave spring’, while naming the actual heave spring damper as simply another ‘damper’. Inerters have been in F1 since 2006, predating Renault’s mass damper. Their design and purpose is well documented and shouldn’t be considered something that needs censoring. It’s also this section that fails to showcase the RB5-6 gearbox case. Instead using a pushrod suspended RB4 (2008) gearbox, albeit one made in carbon fibre. The steering column, rack and track rods are similarly illustrated with CAD images. This usefully shows the articulation in the column, but little of the hydraulic power assistance mechanism. Page 67 starts the section on brakes, again fantastic CAD images supply the visual reference for the upright, brake caliper and brake duct design. 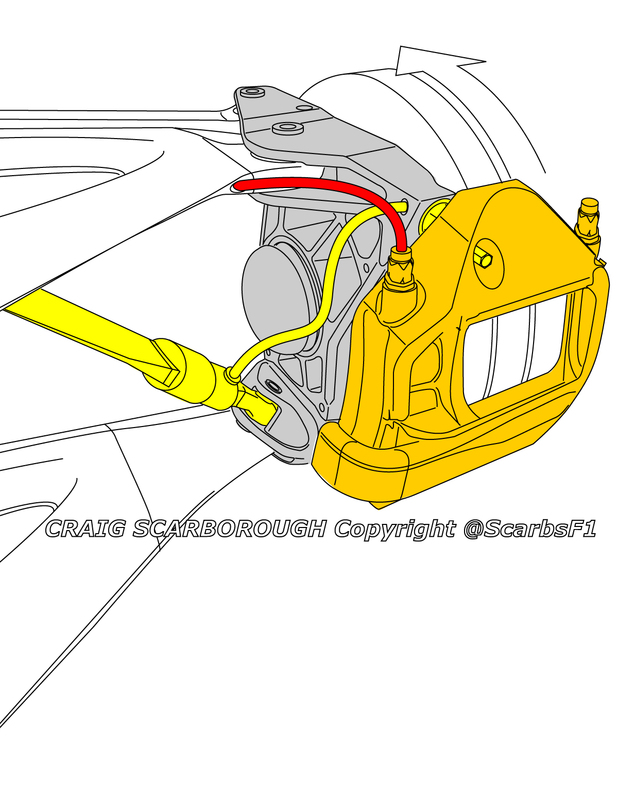 As well as a schematic of the brake pedal, master cylinder and brake line layout of the entire car. A nod to more typical Haynes manuals shows the removal of the brake caliper and measure of the Carbon disc\pad. A further CAD image shows the brake bias arrangement with both the pivot at the pedal and the ratchet control in the cockpit for the driver to alter bias. Although not a RBR component the Renault engine is covered in the next Chapter. An overview of the complex engine rules regarding the design and the specification freeze kicks off this section and cites the tolerances and compression ratio for a typical F1 engine. Pneumatic valves, for along time an F1-only technology are explained, but even I failed to understand the schematic illustrating these on page 77. Also covered in the engine section is some more detail on the fuel, oil and cooling systems. With useful specifics, like capacity of the oil system at 4 litres and water coolant at 8 litres. Again some nice CAD images illustrate the radiators within the sidepod. 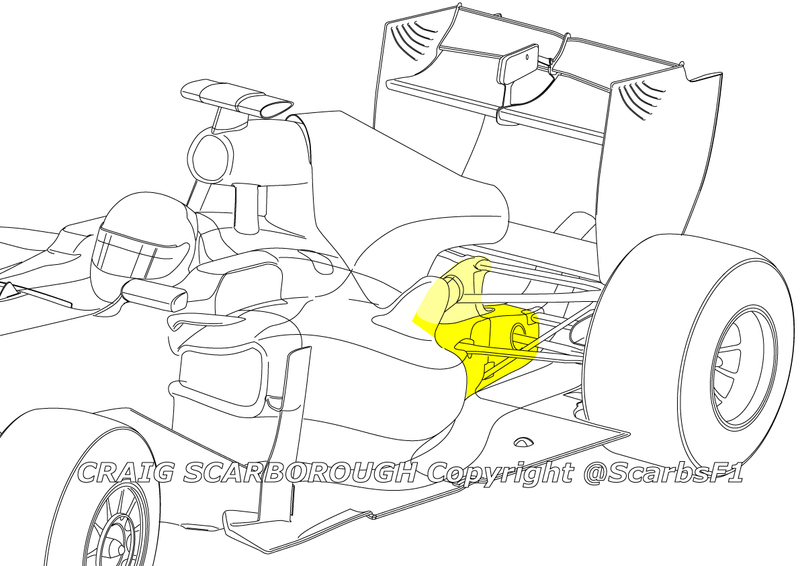 Many sections have a yellow highlighted feature column; this sections feature is on the engine start up procedure, one of the mundane, but rarely talked about processes around an F1 car (other features are on the shark fin and brake wear). As KERS wasn’t used up until 2011, this topic is skipped through with a just a short explanation of the system. Moving rearward to the transmission system, the old RB4 gearbox makes a reappearance. Again this disappoints, as some quite common F1 technology does not get covered. Page88 shows some close up photos of a gear cluster, but this is not a seamless shift gearbox. In fact seamless shift isn’t mentioned, even though it made its RBR debut in 2008, the year of the gearbox showcased in the book. I know many will highlight that this might be a secret technology. But most teams sport a dual gear selector barrel, each selector looking after alternate gears to provide the rapid shift required to be competitive in F1. So I think this is another technology that could be explained but hasn’t been. Tyres, Wheel and Wheel nuts get a short section, before the text moves onto electronics. A large part of the electronic system on a current F1 car is now standardised by the Single ECU (SECU) and the peripherals that are designed to support it. So this section is unusually detailed in pointing out the hardware and where it’s fitted to the car. From the tiny battery to the critical SECU itself. Other electronic systems are briefly described from the Radio, drivers drink system to the rain light. Of critical importance to the modern F1 car are hydraulics, which are detailed on p105. As with the other sections, CAD images and some photos of the items themselves explain the hydraulic system, although there isn’t a complete overview of how it all fits together. Rounding off the anatomy chapter is the section of safety items and the cockpit. The steering wheel and pedals are well illustrated with CAD drawings and keys to the buttons on the wheel itself and on the switch panel inside the cockpit. While I have pointed that the hardware shown in the anatomy chapter isn’t necessarily of the RB6, what is on show is obviously genuine and recent RBR. So for those not so familiar with the cars constituent parts, there isn’t a better source of this available in print today. 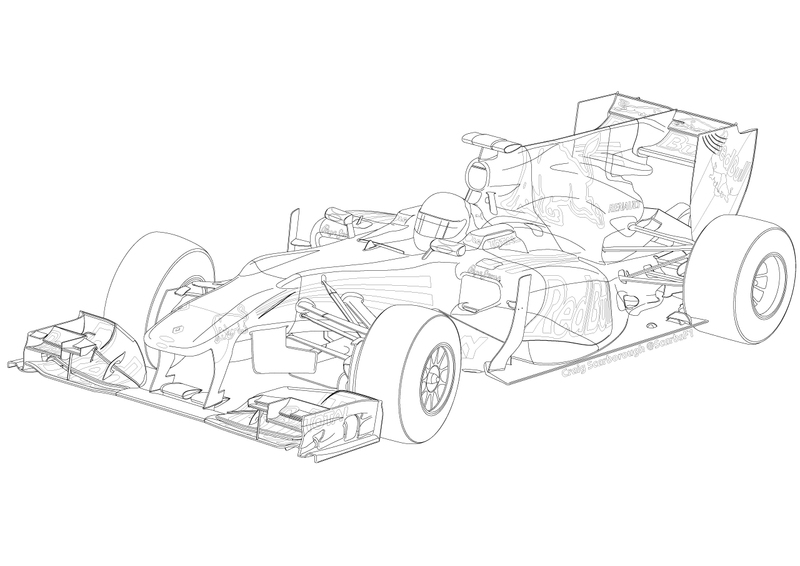 Even web resources will fail to have such a comprehensive breakdown of an F1 car. Moving away from the Haynes format of a workshop manual, the book then moves into a chapter on the cars design, with comments from Adrian Newey. It details the Design Team structure and some of the key individuals are listed. The text then covers the key design parameters; centre of the gravity and the centre of pressure (downforce). Plus the design solutions used to understand them; CFD, Wind Tunnels and other simulation techniques. Each being briefly covered, before similar short sections on testing and development close this chapter. Although the text makes reference to creating ‘the package’, something Newey excels at. This section doesn’t provide the insight into the overall design philosophy, which one might have hoped for. Where as the Designers view chapter was limited, the race Engineers section was a little more insightful into the rarely talked about discipline of getting the car to perform on track. The process of setting up the car is covered; from the understanding of the data, to the set up variables that the race engineer can tune; suspension, aero, ballast, gearing brakes and even engine. Usefully the grand prix weekend is broken down onto the key events from scrutineering, to running the car and the post race debrief. Feature columns in this chapter include; Vettels pre race preparation and the countdown to the race start. Ending the book is an interview style chapter on the driver’s time in the car, mainly the driver’s perspective from within the cockpit when driving the car on the limit and the mindset for a qualifying lap. A simplistic telemetry trace of a lap around Silverstone is illustrated, although there is little written to explain the traces (brakes, speed and gear), this is accompanied by Mark Webbers breakdown of a lap around the new Silverstone circuit. When I first got this book, I was constantly asked if it was worth the purchase or if I’d recommend it. If my review is critical at points, it’s mainly because some technology that could have been covered wasn’t. Or, that the content falls short of the books title suggesting it was a manual for the RB6. Those points aside, I have learnt things from this book. Like details of the F-duct system, the Front Flap Adjuster and a wealth of smaller facts. There isn’t a better book on the contemporary F1 car. In particular the CAD drawings and close-up photos, just simply aren’t in the public domain. From the pictures we got over the race weekends, we never get to see half the hardware and design work that’s pictured in this book. So I’ll keep this book on hand for reference for several seasons to come. Overall I’d recommend this book to anyone with a technical interest in F1. 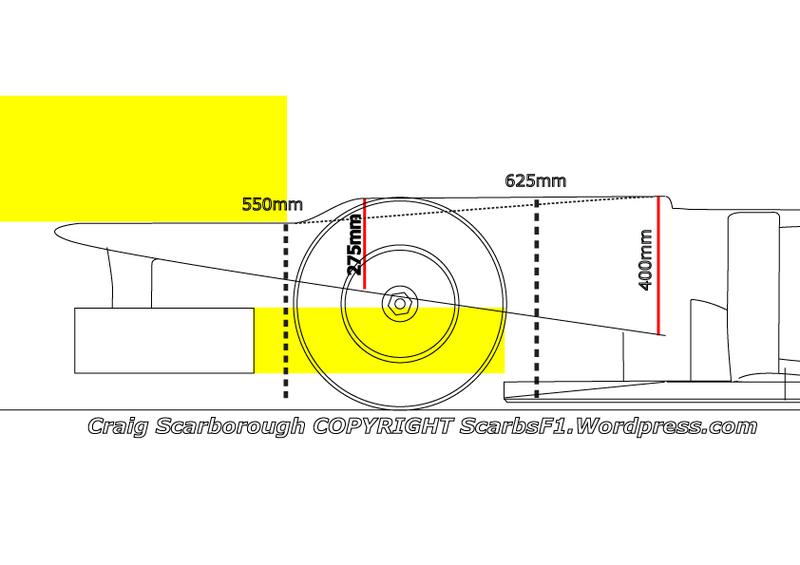 I’ve been drawing this big detail – big scale illustration of the RB6 as a prelude to a prediction of the 2011 car designs. So I’d thought I’d post the 2010 RB6 version up as a wallpaper in mono at 1280 resolution. I’ll do larger sizes on request with or without logos (mail me). Have a great New Year and thanks for supporting me in my first year Blogging and Tweeting. Next year will be my tenth covering the technicalities of the sport, so I’ve got some new ideas up my sleeve.